The Diagramming Framework implements a DraggingService that controls and configures the drag operations on the diagram surface. This tutorial demonstrates how to customize the default dragging operation and restrict the draggable area so that a shape can only be moved within a predefined range in the diagramming surface. In order to implement such a scenario, we will need a sample RadDiagram instance with two RadDiagramShapes, a Rectangle that describes the draggable area within the diagram and a few buttons to give the user control over the drag operation. Drag shapes only while the mouse is within a predefined draggable area. 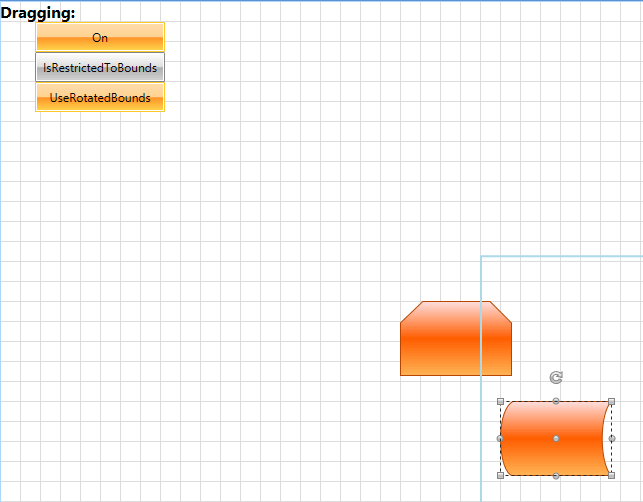 Drag shapes only within a predefined draggable area by making sure that no part of the shape is outside this area. Take into account the rotated bounds of a shape when dragging it in a predefined draggable area. In order to restrict the RadDiagramShapes dragging area, you need to create a custom dragging service. This means that you have to start this implementation by creating a new class that derives from the DiagrammingFramework DraggingService class. IsRestrictedToBounds - a bool property that gets or sets a value determining whether the shapes should entirely be within the actual bounds of the draggable area. UseRotaitonBounds - a bool property that gets or sets a value determining whether the rotation bounds of a shape should be taken into account when applying dragging restrictions. The rotation bounds are the actual bounds of a shape after rotation. IsOn - a bool property that gets or sets a value determining whether to restrict the dragging within a predefined area. DragAllowedArea - a Rect property that gets or sets a value representing the draggable area. The DraggingService exposes a virtual method - Drag, which can be overridden to customize the default drag operation. In this method we will have to handle all restriction cases. With the above code we calculate a new drag position only in the cases when the mouse leaves the designated dragging area. Although these calculations will not stop the mouse from moving across the diagramming surface, they will stop the selected shapes from being dragged further away. If you run the solution now, you should see the On button as checked which means that the mouse position during drag should always be within the blue rectangle indicating the draggable area. If you click on the IsRestrictedToBounds button, you will change the drag restrictions to use the shape bounds when identifying the available dragging positions of a shape. And as the UseRotatedBounds button is also checked the rotation bounds of the dragged shapes will also be taken into account while applying the drag restrictions.